The Peutinger Map is the only map of the Roman world to come down to us from antiquity. An elongated object full of colorful detail and featuring land routes across Europe, North Africa, and the Near East, it was mysteriously rediscovered around 1500 and then came into the ownership of Konrad Peutinger, for whom it is named. Today it is among the treasures of the Austrian National Library in Vienna. Richard J. 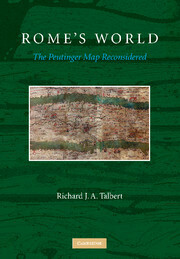 A. Talbert’s Rome’s World: The Peutinger Map Reconsidered offers a long overdue reinterpretation and appreciation of the map as a masterpiece of both mapmaking and imperial Roman ideology. Talbert’s print volume is accompanied by a companion website that offers digital content related to the Peutinger Map, which is Map A on this site.